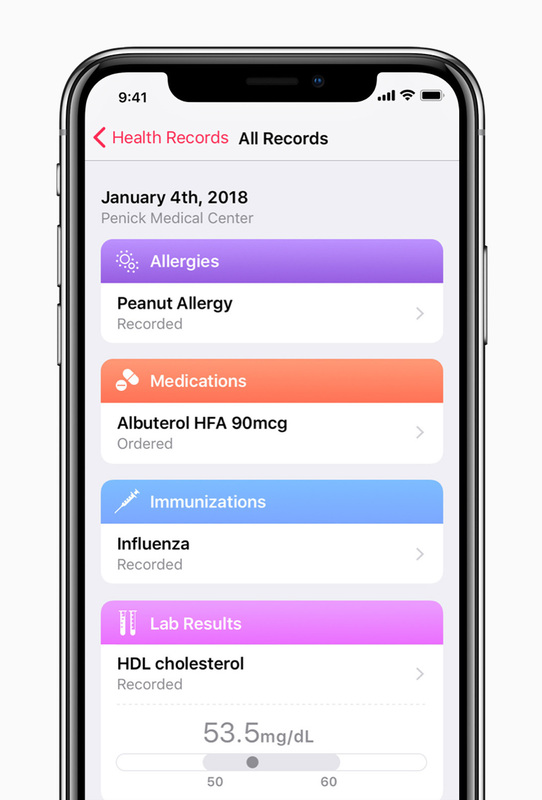 Apple iPhone Software Update Will Support Medical Records : Shots - Health News In a planned upgrade of Apple's operating system for iPhones, the Health app will include health records, so people can take detailed, personal health information anywhere. An upcoming iOS update will allow Apple users to see their health records on their cellphones. Klein's prescription history was hidden somewhere in the hundreds of pages of medical records his new doctor had to go through. "If I had been able to go into an app sitting in his office and look through my prescription history, I would have known that, yeah, we tried that a couple years back and it didn't work well," he says. A feature like that will soon be available for some patients with iPhones. 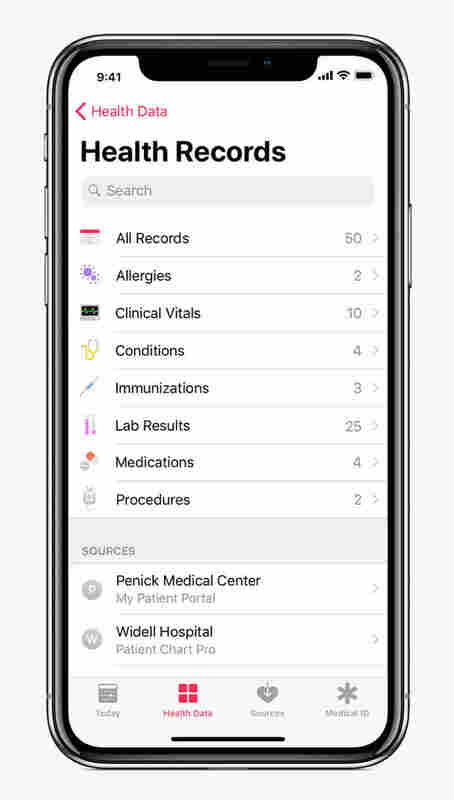 In the upcoming release of Apple's iOS operating system for iPhones this spring, the Health app will include health records, so patients can take information about their immunizations, medications, lab results and more with them. The feature will first be available to patients of medical providers who partnered with Apple, including Johns Hopkins Medicine; OhioHealth; Ochsner Health System in Jefferson Parish, La. ; and Cedars-Sinai in Los Angeles. It won't cost those patients anything to use this feature, assuming they're already iPhone users. Apple's announcement says more medical facilities will offer this feature in the coming months. Some doctors hail it as a big shift away from patients having to handle a big pile of paper records every time they see a new doctor. But Google offered a similar service before and it failed. The search giant shut it down in 2012. Can Apple succeed where Google didn't? Dr. Jonathan Slotkin says yes; he is a medical director handling digital patient engagement at Geisinger Health System in Pennsylvania, one of Apple's partners. Unlike even a few years ago, a lot more people now use smartphones and the phones are more secure. There's now also a technical standard for transferring electronic medical records. "Even if I get care at three different places and maybe they use three different electronic systems, now in one place that I possess in an encrypted way, I have all of that information at my fingertips," he says. He adds this will make transferring information easier for patients who have to move, or go to a specialist. The health records feature could also change doctors' habits in some ways, says Dr. Isaac Kohane, chair of the department of biomedical informatics at Harvard Medical School and a professor of pediatrics. "For some reason, and I say this as a physician, most physicians, if they don't actually know how a test was done, somehow imagine it was done wrongly, and therefore repeat a test, not only at a cost but at some pain to the patient," Kohane says. "If you have a reliable authoritative description of the test and its results, that uncertainty goes away and that excuse to repeat tests goes away as well." Kohane called Apple's new feature a "tectonic shift" in a commentary for member station WBUR's CommonHealth. But Apple will have to address one big problem that Google had with Google Health, a similar health records service: It was popular with only a niche audience — tech-savvy patients and their caregivers, and fitness enthusiasts. The product didn't attract a wide base of users. This time will be different, says Dr. Ida Sim, a co-director of biomedical informatics at the University of California, San Francisco Clinical and Translational Sciences Institute. Why? Because unlike with Google Health, patients no longer have to do the heavy lifting of entering or scanning their own data. Also, the 21st Century Cures Act of 2016 pushed federal agencies and providers to use electronic health records, and now there is a data standard for personal health records, which wasn't the case in 2011. However, she writes in an email that wider adoption will still be an issue. "We'll probably see huge numbers of people getting their initial Health Records populated. The issue is, then what?... The value will come from third party apps that use Health Records to provide meaningful value to patients, and until this value is demonstrated, I think Health Records uptake will be large but retention and continued engagement of patients will be challenging." Alan Yu reports for The Pulse, WHYY's health and science show.